Local Animals: Oooo, That Smell! Spring is in the air, and the thoughts of young animals everywhere are turning to love. Unfortunately for the striped skunks (Mephitis mephitis) in our area, that also leads males to roam far and wide in search of females, and many of them wind up dead, the victims of encounters with cars. Sadly, that’s all most of us know about them. Skunks have a bad rap. Most people know them only as a foul-smelling critter that carries rabies – and while both those things are sort of true, there’s a lot more depth to them than that. First of all, they’re a successful species, and pretty much everywhere. From southern Canada through the entire US and into Mexico, striped skunks are adaptive, and can live in forests, cultivated fields, swamps, arid plains, and even cities. I found studies giving a wide range of population densities, but most seemed to settle on 5 per square kilometer as a decent average – including in metropolitan Toronto, Canada. That’s one skunk for every 50 acres or so. I’ll let you quickly do the math on how many skunks are probably in your neighborhood right now. The other “local” skunk in the east, the Eastern Spotted Skunk (Spilogale putorius) is a little more sporadic, and mostly in the Appalachians and out through the Midwest – but they’re pretty common too. So back to those roving males – it’s skunk mating season right now, typically anywhere from mid-Feb to mid-March. Pregnant females will gestate for about 60 days, at which point (mid-April to mid-May) they’ll go home to their burrows, and have a litter of 2-10 kits. Born blind and helpless, the kits will stay with mom underground until being weaned at about 8 weeks, at which point they’ll start following mom around, typically single-file, quickly learning how to find and eat grubs and insects. By the time they’re three months old (end of summer), they’re independent. Males will venture off on their own, while females may hang around with mom through the winter. Both sexes will be ready to have their own litters by this time next year. Many young skunks don’t make it to adulthood – winter weather is one killer, but disease, cars, and predation by raptors, foxes, and bobcats also take their toll. Fully grown, they’re about the size of a house cat, and in the wild they only live 2-3 years, though occasionally individuals might live to the ripe old age of 6. Given their short average lives, this strategy of large litters and rapid maturation helps keep population numbers up. Skunks are semi-nomadic by nature. They stick to a territory where their food is plentiful, and since they’re opportunists, they can eat almost anything. Insects are their favorite, but when those aren’t around (like now), they’ll also eat small rodents, frogs, eggs, baby birds, vegetation, fruit, fish, and human garbage. They have long front claws that enable them to tear apart rotting logs, and they’ll sometimes dig tell-tale holes in your yard, about 1-3″ across and just as deep, going after worms and grubs. Though they establish a routine and territory, they don’t seem to mind other skunks around – in fact females will often gather in communal dens of multiple animals, particularly over the winter, and have even been known to share dens with raccoons and opossums on occasion. This only works among females though – more than one male is a crowd, and the younger or weaker will be chased off. Their burrows are typically borrowed – an old groundhog or fox den is perfect for a skunk, as are other pre-existing hollows under rock piles, in culverts, hollow logs, or under foundations of houses and sheds. Striped skunks can’t climb, but their spotted cousins can and do, and so sometimes will den in tree hollows or out in the hayloft of the barn. Skunks don’t hibernate, but they can spend weeks at a time underground during a cold spell or when there’s deep snow on the ground. Otherwise, they’re out roaming all winter too. Skunk tracks are pretty distinct, in that they have five toes on both front and back feet, with a smaller inner toe (analogous to our thumb). (The 5-toed Penn State lion print actually looks more like a skunk print than anything else!) Their front paws leave a print the size of a quarter, with claws that are very long, leaving a claw-mark well in front of the toe pads. They are also “pacers”, meaning they walk by lifting both left legs, then both right legs, leading to that characteristic waddling motion. Their insect diet is usually a benefit to us humans, though they can be nuisances around hen-houses, going after both eggs and young birds. They can take a toll on waterfowl nests, but they also love to dig up and eat the eggs of snapping turtles. In fact, they’re the only significant predator of the turtles, which, all things considered, are a more significant predator to the water birds. So why don’t we appreciate these cute little critters? (Yes, they’re cute! Admit it!) Many of us may have a skunk as a “neighbor” that visits the yard every night, or maybe even lives under the shed. They’re mostly nocturnal (spotted skunks more strictly so), so unless they’re raiding the chicken coop or leaving digs in the yard we hardly know they’re around. Unfortunately for these little guys, encounters with skunks are tense. They’re NOT aggressive, they’re not fast, and they can’t see well (beyond 2-3 feet everything’s a blur), relying on their sense of smell to find all their mostly immobile prey. Despite this, they get a lot of respect from most animals, because their defense mechanism packs a wallop – a pungent spray of foul-smelling musk ejected from specialized scent glands in their rear ends, accurate up to about 10 feet away. Animals that don’t know this get a quick lesson, and learn the hard way. Eastern Spotted Skunk. US National Park Service, public domain. 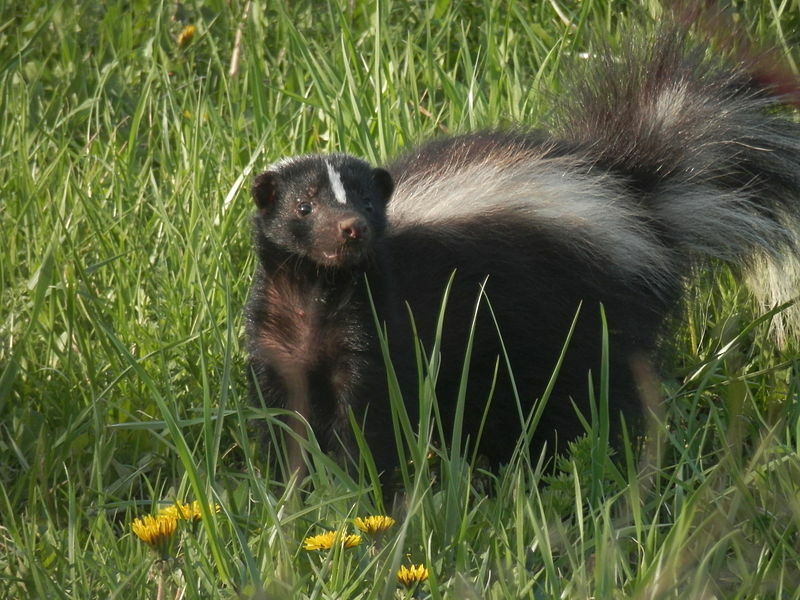 Skunks don’t walk around in clouds of stink, despite what Pepe Le Pew cartoons might depict. In fact, they’re actually pretty selective about when and what to spray. They only have enough ammunition for about 5 shots, and it takes a week or more to replenish their supply. Younger skunks typically spray more readily, older ones will take more time to warn their targets. Warnings consist of, first, a staring contest, then perhaps a little charge and stamping of the front feet. Lastly, a skunk will twist its rear end around so it can point its tail at a target and keep eyes on it at the same time. THEN, it’ll shoot. Spotted skunks have a slightly different warning – they’ll actually do hand-stands and raise their tail so they can shoot over their heads at you. Like some sort of furry scorpion. All of this can be avoided simply by keeping your distance and not pestering the skunk. Like any wild animal, they don’t like being surprised – if they’re afraid, they will defend themselves. But given their poor sight, and generally gentle demeanor, you can actually be fairly close to a skunk without fear of getting sprayed. They’re confident in their defense, and pretty content to let you walk by and mind your own business – and given their poor sight they may not even notice you. I’ve had plenty “close encounters” with skunks that ended peacefully – including most recently having one explore our Boy Scout campsite this summer. Only about 10 boys saw it, but we had about 30 kids running around and yelling nearby, and the skunk ignored us completely. I’ve also had one walk right through a campsite without slowing down or even casting a sideward glance. Not that I’m suggesting you TRY and get close, merely that seeing a skunk is not a reason to panic. So knowing a skunk lives nearby is not a reason to start thinking about how to get rid of it – chances are it’ll be moving on to new hunting grounds soon anyway. Besides, it’s out there eating bugs you probably don’t want around. They’ll even dig up yellow-jacket nests! Skunks can and do carry rabies, so if you see one acting strangely, like deliberately TRYING to get close to you, that is cause for concern. Keep yourself and pets away (even more so than usual), and call animal control. But aside from that rare circumstance – think of skunks as just one of the many wild neighbors we share the land with. Learn to appreciate them, and realize that they’re just trying to get by and thrive in a world that isn’t always easy for them. They have no interest in stinking up the place – but if we let our dogs attack them, or hit them with cars, that’s certainly what they’ll do. It’s the only defense they’ve got!